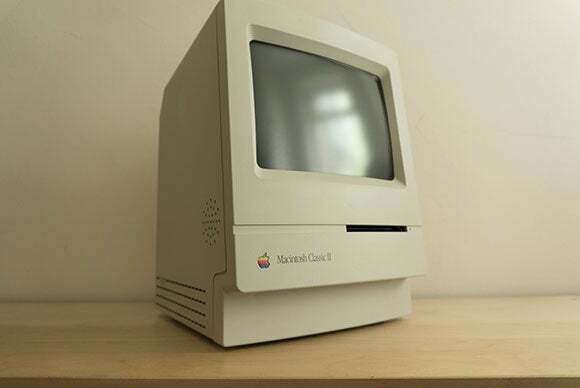 From its compact size to its 1-bit black and white display, the Mac Classic's adorable form factor is one to be celebrated. At the heart of each Think Retro column I’ve written so far has been some thing: A practical guide, a lesson from history, a celebration of design, say. At the heart of this one is heart. 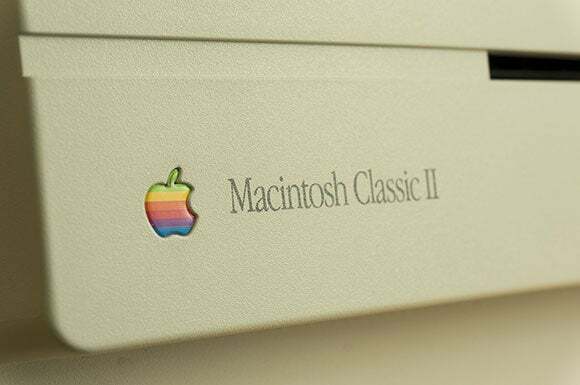 This week’s column is nothing more nor less than an outpouring of love for one of the sweetest, most exquisite little computers of all time: The Macintosh Classic. 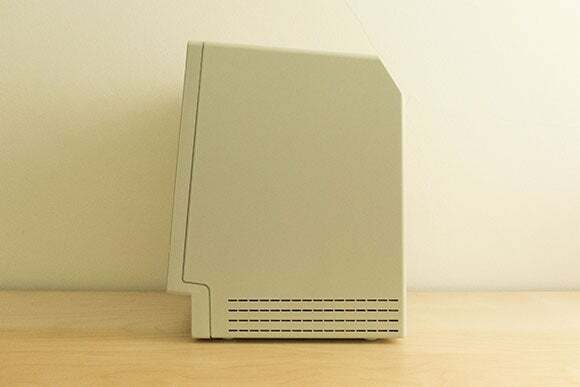 I know that for many the powerful and flexible Macintosh SE/30 is the pinnacle of these early compact Macs, and yes, the thick chamfers and endearingly chunky styling of the original Macintosh and its siblings have charisma far beyond mere nostalgia, but for me the Classic’s purity of line is truly special. 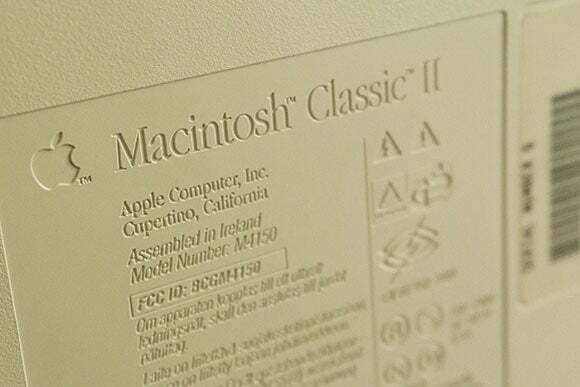 It is, in fact, classic Apple. Everything extraneous is stripped away—within engineering constraints—leaving you with just the essence of the computer. And that’s not to say it’s bland and anodyne. No, the Classic retains its playfulness and personality—that’s part of the essence that is being exposed, that has to be retained, rather than a wacky afterthought. It’s so easy to anthropomorphize the Classic, even though when pressed you realize there’s no actual eyes-nose-mouth structure that usually triggers this recognition. Look at how its face tilts up towards you, at once a smart practical trick to make the screen easier to see on a computer which will sit below your eye-line, and an evocation of nothing so much as a puppy looking up at you, begging to play. It’s easy to pick up and transport from place to place. 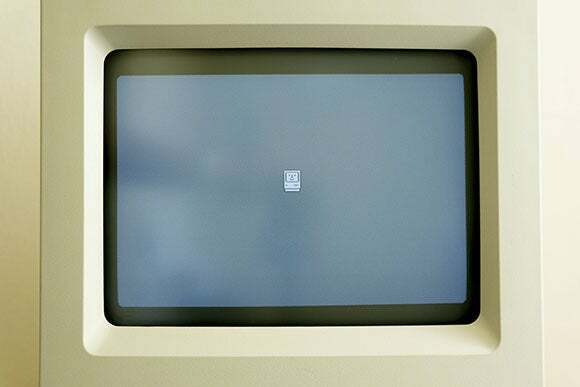 I’m too young to have used a compact Mac as my main machine, but I can readily imagine taking it into a dorm at college and then home again at the end of the semester. At 16 pounds, it’s not light, for sure, but the handle built into the top means it’s easy to carry regardless, and it certainly doesn’t feel heavy. That feeling persists when you switch it on. The switch itself—easy to locate by touch, not least because it’s directly above where the power lead plugs in—is not just an intensely satisfying shape but makes the most pleasing, positive, unmistakable thunk when you flick it. When you do, you get that reassuring beep and then a businesslike whir as it boots; it feels like you’ve woken something up. 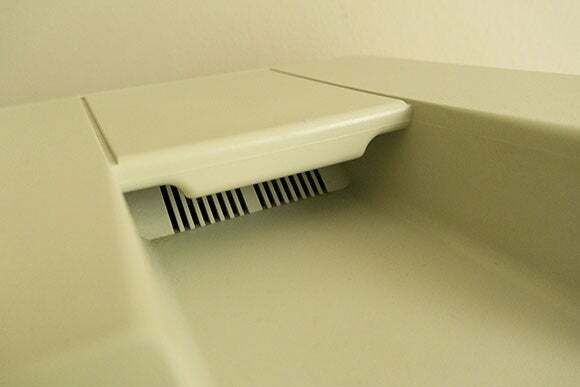 The cathode ray tube sleepily warms up, and before long you’re greeted with the happy Mac icon. I do mean ‘greeted’ too. It’s a little pathetic, but our hard-wiring and cultural conditioning means that when I see a pattern of pixels making up a crude face, at some level I parse it as a person, and get that little tickle of recognition and fellow-feeling. Hello, little Mac! What shall we do today? And that screen! That dinky, sharp, perfect little screen! There’s something fundamentally honest and pure about a 1-bit, black and white display, and the crispness of the pixels is a genuine delight even in these days of pixels so tiny we can’t actually see them. 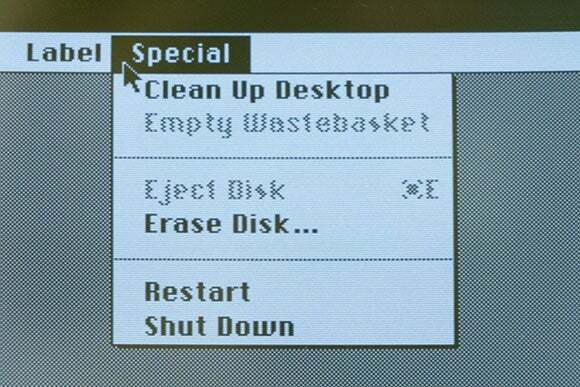 The low resolution itself of the display means that each pixel on screen is sharp, unlike with the fuzziness of the higher-resolution, color CRTs that were to follow. 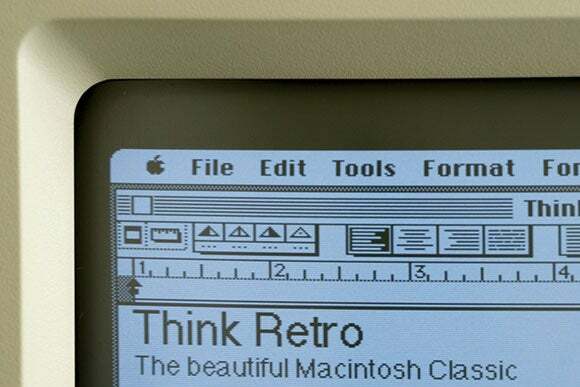 I’ll never stop loving the 1-bit interface design of these early Macs, or the tricks its designers pulled to imply drop-shadows and shades of grey. It’s clean and spare and elegant, but despite having to cram everything into what by today’s standards is a minuscule screen, it still has bags of personality and charm. Witness, for example, how the rounded edges of the UI echo the rounded edges of the bezel surrounding it. So yes, I completely adore the Classic form factor. It’s such a captivating, self-contained bundle of happiness. So compact, so totable. I just want to tousle its hair and pinch its cheeks and call it slugger. Counter-intuitively, despite its bulkiness and old-fashionedness, it actually feels smaller than modern Macs, and not just because of its diminutive 9-inch screen. 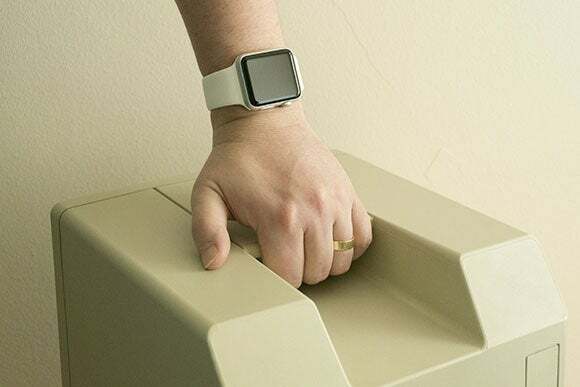 Its small footprint means that a Classic plopped onto a desk both looks neat and discreet, and also doesn’t dominate and demand attention in the way that even the smallest of the modern iMacs—its direct descendants—do. The original Classic was criticized for its low power and lack of expandability (and where have we heard that recently? ), criticisms the Classic II largely answered, but it’s the external aesthetic of the Classic and Classic II that I love so much.